Junior Achievement in Washington, DC. His mother was Margaret French McLean. The McLeans (MacLeans) were long-time residents of the Upper Cape Fear River in North Carolina. Angus helped start the Bank of Lumberton, many area businesses. Angus McLean was elected Governor of North Carolina in 1924, serving from 1925-1929. Growing up in Lumberton, in 1937 Hector graduated from the local high school and enrolled in Davidson College. He graduated with a BS degree in 1941. He was on active duty during World War II, serving as a Major in the U.S. Army in the European Theater. He is the recipient of the Bronze Star. Upon returning from the war, he enrolled in Law School at the University of North Carolina at Chapel Hill, receiving his LLB degree in 1948. A practicing attorney, he was elected mayor of Lumberton (1949-1953). 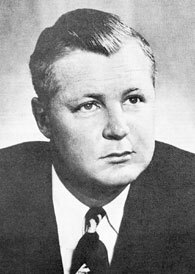 He became President of the Bank of Lumberton, later called the Southern National Bank, in 1953. He also has been the President of the Virginia and Carolina Southern Railroad Company. He was appointed in 1961 to the NC Senate. He has served as chairman of the board for St. Andrews Presbyterian College and served on boards for Peace College, Flora MacDonald College. He served on numerous boards for business firms and civic groups. He married Lyl Warwick on Dec. 18, 1944.